Antonio Guterres on Friday condemns deaths of Palestinian Arabs during clashes in Jerusalem, calls for an investigation. United Nations Secretary-General Antonio Guterres on Friday condemned the deaths of Palestinian Arabs during clashes in Jerusalem, calling for an investigation. 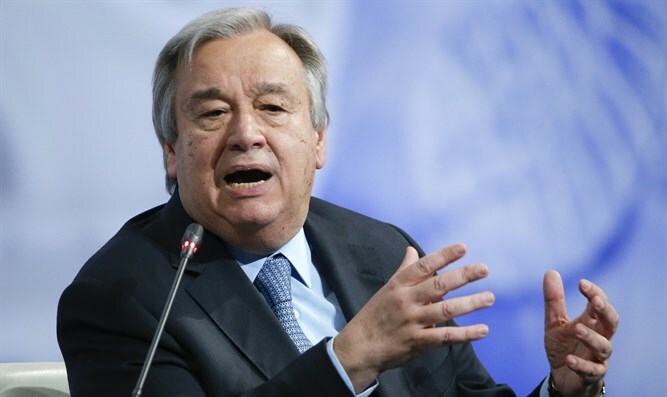 Guterres “deeply deplores the death of three Palestinians in clashes today with the Israeli security forces and calls for these incidents to be fully investigated,” said a statement from the UN chief’s spokesman. He urged Israeli and Palestinian leaders to refrain from actions that could further escalate the situation. Guterres also called all political, religious and community leaders to help reduce tension. “The Secretary-General reiterates that the sanctity of religious sites should be respected as places for reflection, not violence,” the spokesperson said. It appears as though Guterres’ statement was written before the murderous attack in the community of Halamish. The clashes in Jerusalem and nearby cities and towns came after the Cabinet decided overnight Thursday that the magnetometers will remain at the entrance to the Temple Mount as part of the new security measures at the compound. Israel’s security measures at the compound have caused an uproar in the Arab world. They were condemned by the Palestinian Authority, the Jordanian Waqf and the Jordanian government, which demanded a return to the status quo. Earlier on Friday, the Egyptian Foreign Ministry blasted Israel over the clashes in Jerusalem and the area, urging the Jewish state to “stop the escalation”.